teel structure workshop is a cost-effective building form that uses steel structure as the main load-bearing member. It can be designed to take any kind of shape and size according to your requirements. 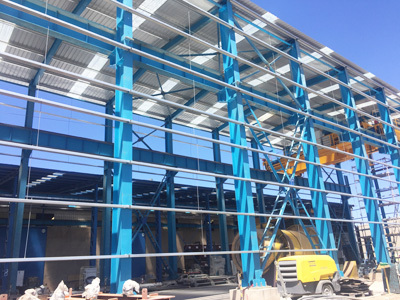 With easy and quick construction, low cost and durability, the steel structure is a popular choice to erect various industrial buildings. 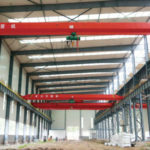 If you are looking for an economical, reliable and durable workshop, let’s think about steel structure. Heavy steel structure delivers high strength, reliability and durability, making it an ideal option to construct heavy machine shops. The steel workshops can be either small or large to suit your production needs. 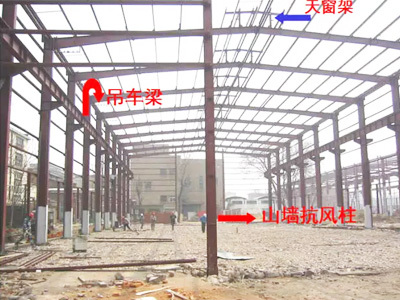 Light steel structure is more economical to erect industrial buildings. 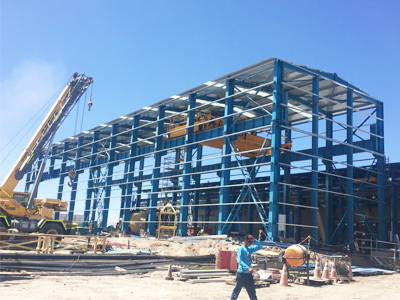 The structural steel generally has a small cross-sectional dimension, which can effectively utilize the building space and reduce the height of the facility. The structure has good rigidity, light weight, and is very easy to transport. 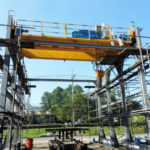 In addition, the structural steel makes it possible to create single span, double span or multi-span for your workshop. 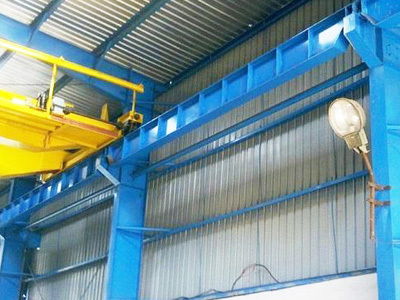 Overhead crane: the rated load capacity is 20 tons. The crane is designed for moderate service. 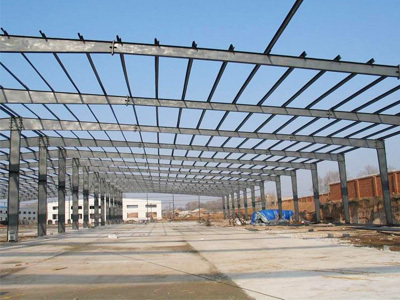 Steel frame construction: light steel structure, single span. The roof is designed with polyurethane roof panel and self-cleaning panel to reduce the ash accumulation and keep the roof clean. The wall uses polyurethane wall panel for heat insulation, sound insulation and better appearance. The lap joint utilizes a fluid dynamic design to ensure convenient installation and good sealing. 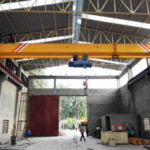 What Are The Benefits of Steel Structure Fabrication Workshop? 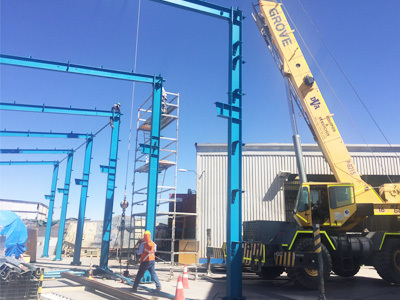 It is quick and easy to build at site since all the main components can be prefabricated at manufacturer’s factory, and then erected at site. It is flexible as the structure can be easily modified or extended to suit your future use. It is very good at resisting dynamic forces like strong winch, snow and earthquake. It is designed with fire retardant coat for excellent fire resistance. The structural steel enables you to create large span. 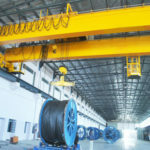 If an overhead crane is required to be installed inside the building, there are a few things you need to consider in the design of a steel frame workshop. 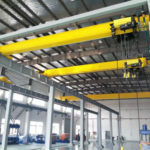 In order to determine the dimension of your workshop, you should first specify your desired crane specifications, such as rated load capacity, lifting height, span, lifting speed and hook coverage. 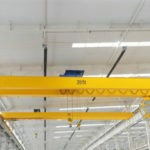 Our overhead cranes can lift up to 300 tons, and different configurations are available to make sure you end up with the right crane, like single girder, double girder, top running and underhung system. 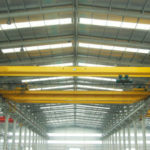 We offer the design, fabrication, delivery, installation and maintenance of both steel structure factory and overhead cranes. If you have any question, please feel free to contact us online or give us a call. Primary components: steel columns, steel beams, wind-resistant columns, runway beams. Steel columns: H-shaped steel column of equal section can be applied when the horizontal span of the facility does not exceed 15m and the column height does not exceed 6m. Otherwise, the variable section should be used. Steel beams: generally C-shaped or H-shaped steel is used. The main material can be Q235B or Q345B. Wind-resistant column: it is a structural component at the gable, mainly used to transmit the wind load. Runway beams: this component is used to support the rail track onto which the crane runs. It is designed according to your lifting requirements. Purlins: C-shaped or Z-shaped purlins can be used to support the wall and roof panels. The thickness of C-shaped steel can be 2.5mm or 3mm. Z-shaped steel is especially suitable for large slope roofs, and the material is Q235B. 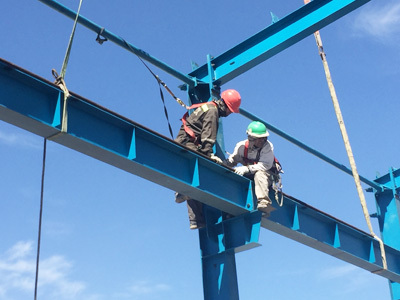 Purlin brace: it is used to keep the lateral stability of the purlin, increase the lateral stiffness as well. Bracing system: the horizontal and vertical bracing systems are intended to ensure the overall stability of the structure. Color steel tile: it is suitable for roofing, wall surface, interior and exterior wall decoration of various industrial factories. The thickness can be 0.8mm or less. Typically we use 0.5mm color-coated steel plate for your workshop. Sandwich panel: the thickness can be 50mm, 75mm, 100mm or 150mm. It features easy installation, light weight and environmental protection. A combination of single layer color steel plate, insulation cotton and steel mesh: this method is intended to strengthen the insulation. Lighting panels are generally added to the roof in order to save energy and improve indoor lighting. Clerestory can be designed at the ridge to enhance indoor ventilation. Column spacing: 6m, 7.5m, 9m, 12m, etc. Span: 9-36m (take a multiple of 3). Single span, double span and multi span are available. 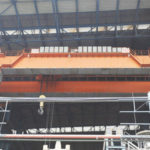 Height: 4.5-9m (without installing an overhead crane inside the facility), or depending on your crane specifications. The price of steel structure workshop does not include the doors and windows. You can fill out the contact form or send us an email to get a free quote. In order to get the most appropriate solution and a competitive price, you are suggested to discuss your desired specifications with one of our experts. They can help you design the right structure and equipment for the job. The quotation can take several days depending on the complexity of your project. Looking for a reliable and affordable steel structure workshop? Get in touch with our sales team now.